Trump Tells Russia: 'Get Ready' For U.S. Missiles Striking Syria : The Two-Way President Trump had a ready retort to a Russian threat to shoot down any U.S. missiles in Syria: "Get ready Russia, because they will be coming, nice and new and 'smart!'" President Trump had a strong message for Russia in their disagreement over Syria, saying in a tweet, "You shouldn't be partners with a Gas Killing Animal who kills his people and enjoys it!" Trump is seen here in the Oval Office at the White House on Tuesday. In response, Russian Foreign Ministry spokeswoman Maria Zakharova wrote on her Facebook page, "Smart missiles should fly towards terrorists, not the legitimate government which has been fighting against international terrorism in its territory for several years," according to a translation by state-run Tass media. Zakharova also said a missile strike could destroy evidence of chemical weapons — or perhaps cover up a lack of such evidence. In early-afternoon comments to reporters, Defense Secretary Jim Mattis was asked about the timing of a military strike on Syria. "We're still assessing the intelligence, ourselves and our allies. We're still working on this," he said. 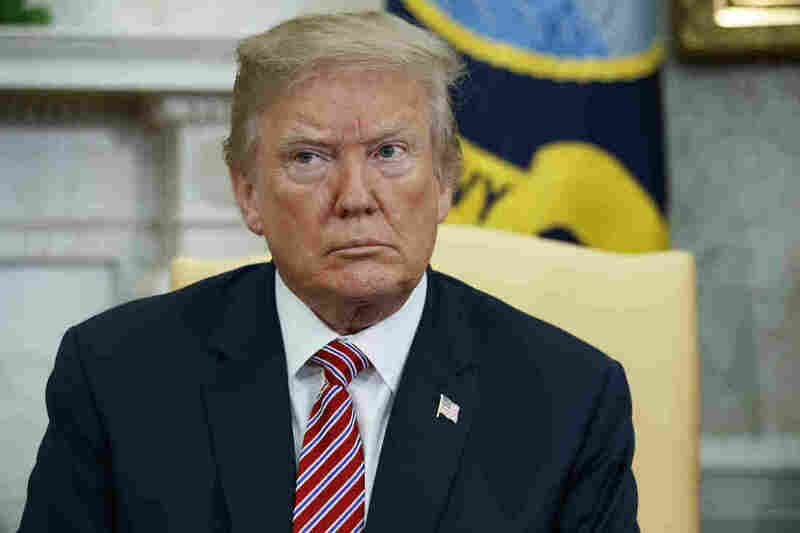 As NPR's Mara Liasson reports, Trump's warning of an international military strike contradicts his earlier criticism of President Barack Obama's actions in Syria. 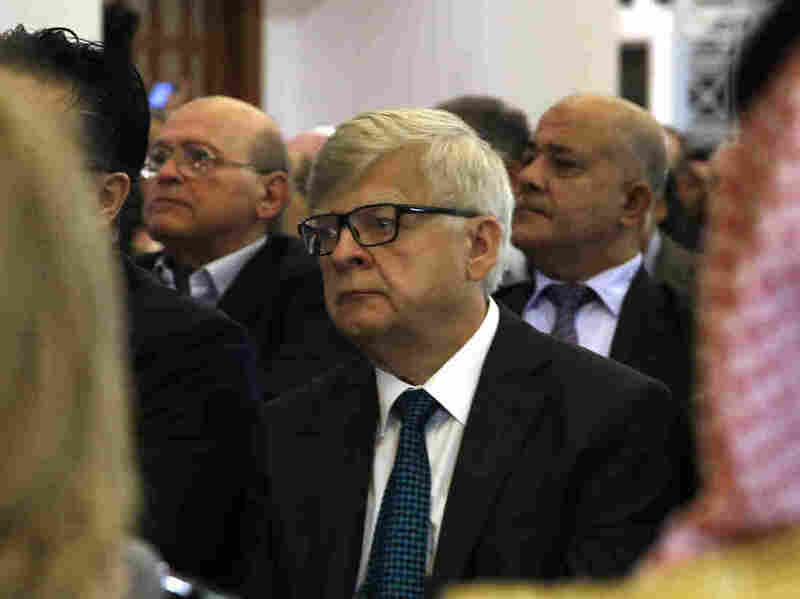 Russia's ambassador to Lebanon Alexander Zasypkin, shown in Beirut last year, warned in a television interview on Tuesday that Russia would "shoot down" any American missiles launched at Syria. "He's doing exactly what he criticized Obama for doing," Mara said on Morning Edition. "He said earlier this week, we'll tell you what we do after the fact. He's often said he doesn't like to broadcast in advance what he would do, in terms of military strikes. But here he is taunting [Vladimir] Putin, just like he did when he tweeted to Kim Jong Un — my button is bigger than yours." "So he's doing the exact same thing that he criticized his predecessors for doing." Trump changed his tone in another tweet that was posted some 40 minutes later, calling for a better relationship with Russia. "Our relationship with Russia is worse now than it has ever been, and that includes the Cold War," Trump said. "There is no reason for this. Russia needs us to help with their economy, something that would be very easy to do, and we need all nations to work together. Stop the arms race?" Trump unleashed his counter-threat hours after Russia's ambassador to Lebanon warned that his country will shoot down any U.S. missiles fired at Syria in a punitive strike on the Damascus regime over its alleged use of chemical weapons. "If there is a strike by the Americans, then ... the missiles will be downed and even the sources from which the missiles were fired," Alexander Zasypkin told Hezbollah's al-Manar TV on Tuesday evening, speaking in Arabic, according to Reuters. NPR's Lama Al-Arian, reporting from Beirut, reports that Zasypkin said he was quoting Russian President Vladimir Putin. The threat applies not only to the missiles, but to their launch sites, she says. However, Zasypkin said that a clash "should be ruled out" and that Russia was "ready to hold negotiations." The diplomat's remarks follow Russia's veto of a U.S. draft Security Council resolution calling for an independent investigation to establish with certainty whether Syria used poison gas against civilians in Douma, a rebel-held suburb of Damascus, last week. Syria has denied that it used poison gas. Trump on Tuesday warned that the U.S. was prepared to take "forceful" action. "We have a lot of options, militarily," he said. Trump and his advisers are weighing a response to the latest news of Syria using chemical weapons one year after American warships launched 59 Tomahawk missiles against the Shayrat air base. That's where the U.S. said planes had taken off before carrying out a chemical weapons attack on civilians in a nearby town, Khan Shaykhun. The former U.S. Ambassador to Syria, Ryan Crocker, says that the U.S. is obligated to strike Syria again. "I think we have to respond militarily," Crocker said on Morning Edition. "To have done so in the earlier incidents and not to do so now would be a very wrong signal to send." "This time around, I do think it has to be different. I would hope that it's true that the administration is in contact with the French and other allies, so it becomes not just a U.S. strike, but a coalition strike, if you will. "And then we've got to think about what's the next step. Are we going to develop a strategy in Syria, because we don't have one now." Before launching the April 2017 strike against Syria, U.S. officials repeatedly warned Russia that the government air base was about to come under attack — in part because Russian personnel had been there. Russia joined the Syrian civil war to fight alongside Syrian President Bashar Assad in 2015. Although its Security Council veto this week was expected, Nikki Haley, the U.S. Ambassador to the United Nations, said Moscow's decision to stand with its ally Assad amounted to "protecting a monster over the lives of the Syrian people." Earlier, Russia's U.N. envoy, Vassily Nebenzia cautioned the U.S. to "refrain from the plans that you're currently developing," saying Washington would "bear responsibility" for any "illegal military adventure." In a further sign that military action may be imminent, Eurocontrol, the European air-traffic control agency, issued a warning on Wednesday to commercial airliners flying in the eastern Mediterranean. "Due to the possible launch of air strikes into Syria with air-to-ground and/or cruise missiles within the next 72 hours, and the possibility of intermittent disruption of radio navigation equipment, due consideration needs to be taken when planning flight operations in the Eastern Mediterranean/Nicosia FIR area," it said, referring to the designated airspace, Reuters reports. In the alleged poison gas attack in Douma on Saturday, pro-opposition rescue workers and doctors tell NPR's Ruth Sherlock that 42 people were killed. However, the Britain-based Syrian Observatory for Human Rights is quoting a lower number. Rami Abdulrahman, the head of the organization, tells NPR it has documented 21 cases where people died "from suffocation," and could not confirm the cause. Doctors have said the symptoms presented by suspected victims of the attack are consistent with chlorine gas. In the past, the U.S. and its Western allies have accused Syria of using sarin gas against civilians, a charge Damascus denies. Meanwhile, the Organization for the Prohibition of Chemical Weapons has said the Syrian and Russian governments have invited it to conduct a fact-finding mission on the ground in Syria to "establish facts surrounding the allegations of the use of toxic chemicals, reportedly chlorine, for hostile purposes in the Syrian Arab Republic."